Tonight on Bravo is an all new episode of The Real Housewives of New York City called “Diss-Invite”. On tonight’s show Ramon plans a lunch gathering to bring her issues in the open and discuss them. If you missed last week’s show called “Boozy Brunch”, we have a full and detailed recap here for you. On last week’s show new housewife Carole openly came on to Ramona’s husband, stating how she only flirts with husbands when their wives are sitting right next to them… LuAnn and Ramona decided to make peace, but LuAnn suspected it wouldn’t last long. Ramona took the opportunity to apologize to Heather but got the cold shoulder from LuAnn, who might not be ready to bury the hatchet. On tonight’s show Ramona invites Aviva, Carole and Sonja for lunch to discuss her current issues with Heather, however, Sonja chooses to have a secret rendezvous with LuAnn instead. LuAnn voices concern that Ramona has control over Sonja but Sonja sets the record straight. Always the journalist, Carole and her friend Tripp head downtown to witness the Wall Street protest, where they takes photos, sign petitions and Carole talks about her time working at ABC News. In order to resolve their issues, Ramona agrees to meet Heather for drinks hoping to get an invite to the London trip but the drinks take a turn for the worse when they actually get talking. Aviva and Heather have a night out where Aviva informs a suspecting Heather that because of her phobias and family, she won’t be going on the London trip. Meanwhile, Sonja hosts a party in honor of her new magazine cover and Ramona pressures her for going on the London trip without her…leading to the first rift in their friendship and many concerns. Tonight’s episode is going to be an exciting one that you won’t want to miss, so be sure to tune in for our live coverage of the show tonight at 9PM EST! While you wait for our recap hit the comments and let us know what you think of season 5 of The Real Housewives Of New York City. RECAP: If you tuned in last week, you’ll recall that Heather invited all of the girls for a weekend in London, except for Ramona. Ramona claims to not be bitter but clearly is as she meets up with Carole and Aviva for lunch. It seems to be the only discussion on the table, at least for wine-slugging Ramona. Aviva clues in the girls to the fact that instead of Heather responding to her (while arranging lunch) she instead had her assistant do it. Naturally this sits badly with Ramona and Carole who think it’s in such bas taste. As that trio lunches, at another restaurant somewhere in NYC sits LuAnn and Sonia. The topic for conversation? Ramona, her crazy drama and lack of boundaries, of course. Carole has friends other than the girls! She enjoys hanging out with her downstairs neighbor named Tripp. He is obviously very smart and when she’s with him, so is she. They discuss protests and hard news rather than just debate a menu for an hour. The much anticipated drink date between Heather and Ramona has arrived. They are not natural or comfortable with each other. Heather has a hard time connecting with Ramona and has a hard time keeping up with her “borderline personality”. They start bickering because Ramona invited Heather to something and Heather is unsure if she can attend. Heather comes right out and tells her that she’s not sure if they’re actually new friends or not. Aviva and Heather meet up for dinner at a rooftop restaurant. Aviva has a phobia about being stuck in small places so Heather holds her hand all the way up. Aviva tells Heather that she’s not going to Londonwith the girl’s. She has admitted “phobias” about flying and just won’t do it without her husband, Reed. Guess what is up for discussion next? You got it, Ramona! Sonja is on the cover of Social Life Magazine and so of course, there is a party in her honor. Carole comments on LuAnn’s need to drop the names of European royalty when she’s around. She refers to it as “royal tourette’s syndrome”. Ramona is gunning for Heather. Being miffed about not being invited to London has turned into full fledged fury. She’s acting crazy over the situation which just reinforces Heather’s not wanting Ramona to ruin her fun weekend. 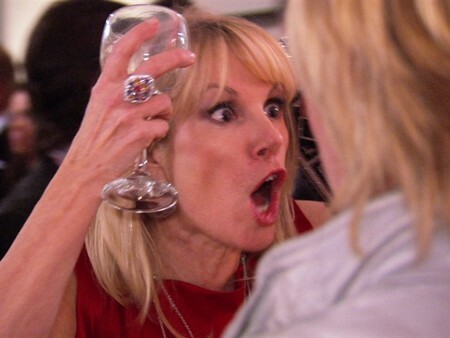 Ramona eventually storms out, which is both childish and disrespectful to Sonja, who invited her in the first place. Heather finally is told about Ramona’s meltdown and is in shock but she refuses to invite Ramona now. How will London unfold? Tune in next week to find out!